Do you often hear people asking “Can you repeat that, please?” or “Sorry, can you say that again.” If you do, then maybe you have a pronunciation problem when you speak English. 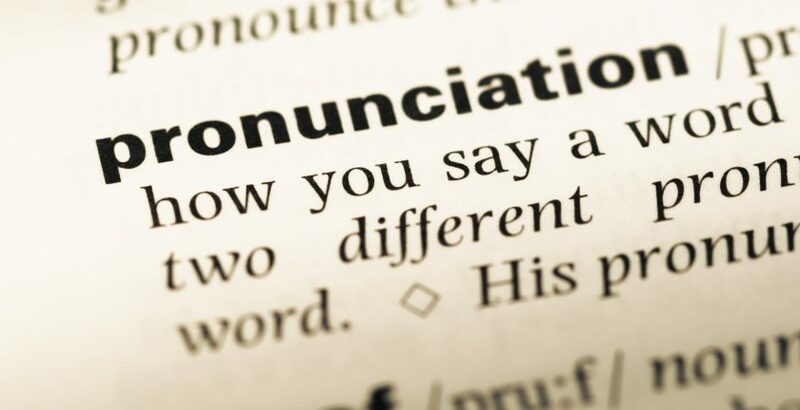 Even if your grammar skills are excellent and you know a huge amount of vocabulary, your pronunciation could let you down when you speak English. English is difficult because it might contain sounds that you don’t have in your native language. So, not only are you learning new words, you have to train yourself to make new sounds. If that isn’t complicated enough, English spelling doesn’t help. Think about buy and by, spelled differently but pronounced the same and what about low and cow, spelled similarly but pronounced differently. Crazy, we know! Some sounds can be hard to tell apart. Did they say ship or sheep, was that here or hair? The best way you can learn to pronounce something correctly is by listening to a native speaker. Listen to English spoken by a native as much as possible, including various different accents. Some ideas for listening practice are: podcasts, radio, tv, and movies. If you want to speak English like a native watch how your mouth moves when you are trying to make a certain sound. If you are having difficulty with a sound, try and find an example video where someone is saying this word and mimic how the person moves their mouth. If you have a favourite TV show in English, try to spend a few minutes with it at a slower speed and first watch how the characters move their mouth and lips then you can try and mimic along with them. The best way to see if you are moving your lips and mouth correctly is by using a mirror or videoing yourself. You can also place a finger in the middle of your lips and notice when you lips move forwards and backwards, and up and down. Using techniques such as these will help you to see if you are moving your mouth and lips in the same way as a native English speaker. For some sounds, the only difference is where the tongue is placed. In your native language, you’ll also move your tongue to make different sounds without even noticing. To improve your English pronunciation start paying attention to this as well. Some of the most difficult sounds to make for English speakers can be “L” and “R” and the major difference between these is where the tongue is placed. There are some great resources on YouTube for the pronunciation of these different sounds or if you know a native speaker, try asking them to say a word with one of the letters you are having a difficulty and notice what they do with their tongue or if you can’t see, ask them! Words are made up of parts, these parts are syllables. While some words have only one syllable, others have many. When trying to pronounce these words yourself try and break them into syllables. Often, you will not have difficulty with a whole word but with just one or two of the syllables. It may be helpful to write the word down in parts (remember that each syllable must contain one vowel or more). Now try saying the word separately a few times and then together as a whole. This will also help you know which part to stress. If you’re having trouble with this, then you can look at the website How Many Syllables which will break the word into syllables for you, tell you where the stress is, and tell you how to pronounce it. English is a stressed language. This means is that certain parts of a word with more than one syllable are stressed/emphasised more than others. Pick a word and say it out loud. Notice where you put the most emphasis/stress on the word. Let’s do one together. Take the word “emphasis” for example, the stress is at the beginning of the word, so when you say it, it should sound like: EM-pha-sis. This is important because a word will sound strange if the stress is on the wrong syllable and sometimes putting stress on the wrong syllable will change the meaning of the word. Take for example “record”. When used as a noun (as in “I bought a new record today.” or “She beat the world record.”) you would stress the first syllable so it sounds like “RE-cord” but if using the same word but as a verb, you would stress the second syllable like this “re-CORD”. It may sound difficult at first but by listening and practising you will become familiar with how to stress each word. By listening to native speakers, you will often hear peculiar and funny expressions. These may not make sense if you pick apart every word but as an expression they can be useful. For example, the phrase “let the cat out of the bag” doesn’t actually mean that somebody released a cat from a bag, it means to tell a secret, often without meaning to. An example sentence would be, “I tried to keep the birthday party a secret from her, but James let the cat out of the bag.” This is an example of a sentence that is still in current usage. Be careful though, there are many idioms and expressions that people learn when they first learn English which aren’t actually used by native speakers. Everyone must have heard of the expression “it’s raining cats and dogs” but it isn’t used often at all. Listen to current podcasts and news programmes and watch new movies and TV series to learn popular and up-to-date expressions. If you want to use English informally, then learn some slang. In the title above, mates is a less formal way of saying friends. Knowing some slang and informal words and expressions will make you sound more natural when speaking English. Just make sure not to use slang in a professional setting. Well, there we go, those are our top tips to sounding more like a native speaker. It might take a little extra time and effort but if you follow our advice you’ll be sounding like you’re the Queen’s son or daughter in no time. But, if you are having difficulty with one word or sound in particular, let us know and we’ll do our best to provide you with our top tips for this.